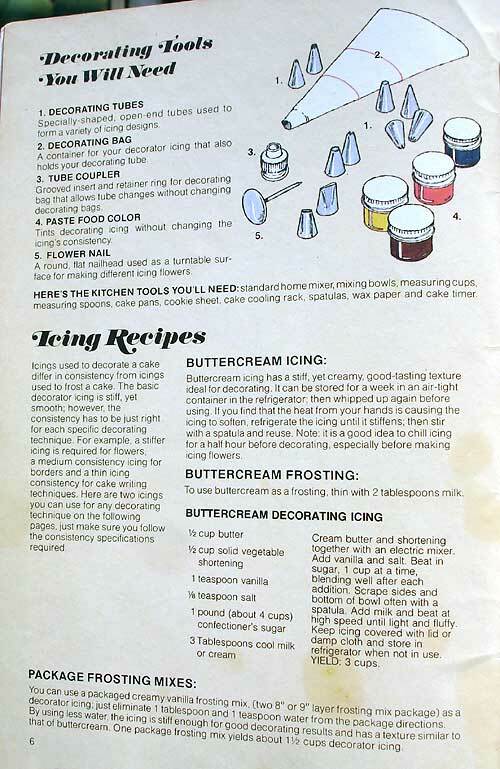 A container for your decorator icing that also holds your decorating tube. Grooved insert and retainer ring for decorating bag that allows tube changes without changing decorating bags. Tints decorating icing without changing the icing's consistency. A round, flat nailhead used as a turntable surface for making different icing flowers. Standard home mixer, mixing bowls, measuring cups, measuring spoons, cake pans, cookie sheet, cake cooling rack, spatulas, wax paper and cake timer. Icings used to decorate a cake differ in consistency from icings used to frost a cake. The basic decorator icing is stiff, yet smooth; however, the consistency has to be just right for each specific decorating technique. For example, a stiffer icing is required for flowers, a medium consistency icing for borders and a thin icing consistency for cake writing techniques. Below are two icings you can use for any decorating technique on the following pages, just make sure you follow the consistency specifications required. Buttercream icing has a stiff, yet creamy, good tasting texture ideal for decorating. It can be stored for a week in an airtight container in the refrigerator, then whipped up again before using. If you find that the heat from your hands is causing the icing to soften, refrigerate the icing until it stiffens; then stir with a spatula and reuse. Note: It is a good idea to chill icing for a half hour before decorating, especially before making icing flowers. 3 Tablespoons cool milk or cream. Cream butter and shortening together with an electric mixer. Add vanilla and salt. Beat in sugar, 1 cup at a time, blending well after each addition. Scrape sides and bottom of bowl often with a spatula. Add milk and beat at high speed until light and fluffy. Keep icing covered with a lid or damp cloth and store in refrigerator when not in use. Yields 3 cups. To use buttercream as a frosting, thin with 2 tablespoons milk.